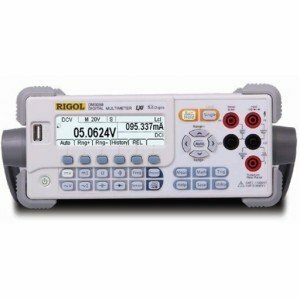 The Rigol DM3068 is a high quality digital benchtop multimeter from the DM3060 series with a very high sampling rate of up to max. 10 kSa/s. The Rigol multimeter comes with very well designed and easy to use controls which also offer comprehensive ease-of-use functions for all measurement tasks. The menu structure is very intuitive to use. The device helps you obtain precise measurement results in a wide range of applications. The LCD with its 256x64 pixels is highly legible and provides a good overview of the many individual functions. It has a maximum resolution of 6½ digits (maximum display value 2.400.000). The Model DM3068 DMM gives reliable, cost effective, full DMM capabilities measuring DCV, ACV, DCI, ACI, Resistance (2 & 4 Wire), Capacitance, Diode Test, Frequency, and Temperature. These DMMs are designed for simple and efficient bench top use, but include software options for datalogging and remote programming from almost any interface. The DM3068 is a great bench tool for high performance, reliable measurements, but also a new high speed data acquisition option for many measurement challenges. You can save measurement results and settings to a USB stick via the integrated USB host port. The device also features 10 internal memory slots for settings. This model can display values up to a maximum of 2.400.000. This allows even larger measurement values to be displayed with several digits after the decimal point. For some measurements, a 2nd value can be measured and displayed simultaneously. However, this only applies to valid combinations such as AC voltage and frequency measurement. Every function and every button is explained briefly in the online help. This help can be activated with the Help button or by simply holding a different button. You can use the multimeter to adapt a variety of sensors and to display the corresponding values. Trend development over several minutes can be captured directly, a temperature trend in this example.